The Ulysse Nardin Chairman Smartphone – if you’ve ever wondered what would happen if a watch and a phone morphed, here it is. 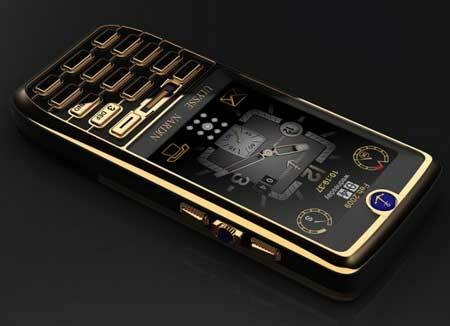 Actually, strike that, this is a luxury watch and a luxury phone morphing. First, a little background. Ulysse Nardin is a very well-known, and well-regarded, premium watchmaking brand, founded in Switzerland in 1846. The other side of this partnership, is a company called SCI Innovations. This company is a little more mysterious, and, on the face of it, is not exactly the driver behind the phone side of this device. In one press release SCI Innovations is described as a company that “has changed the corporate paradigm by adding new concepts to heralded brands and extending their product portfolios while maintaining their pedigree. SCI Innovations works with firms to enter new marketplaces in which the same craftsmanship, precision and care can be applied to a new genus of products.” The two men mentioned as principals of SCI Innovations, are Bobby Yampolsky and Morten Nielsen. They are also the founder of UN Cells Ltd., the company managing the sales and distribution. So it would seem that the watch and bling aspects of this phone have a strong background, but who is responsible for the phone functions of the Ulysse Nardin Chairman Smartphone. Some on the blogosphere have speculated that it’s someone like Sony Ericsson, but I don’t think there’s any solid evidence of this. What I will say is that asked the SCI Innovations people twice about this, and on both occasions the question went unanswered. 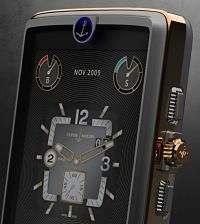 For some time now the operating system of the Ulysse Nardin Chairman Smartphone has been given only as Google Android. I can now confirm that the phone will ship with Android 2.1. Given the phone’s strong wristwatch connection, inside are a few new tricks. Just like a watch, the Ulysse Nardin Chairman Smartphone has a crown, which you wind just as you do on a watch, winding the crown results in a charge to a secondary battery. The phone employs fingerprint ID recognition, customised to protect all files, or individual files. Only 1,836 of each model will be sold. Odd number you think? It’s a nod to the founding year of the Ulysse Nardin company, 1836. And yes, as the headline of this article indicates, the price ranges from US$12,000 to US$50,000. 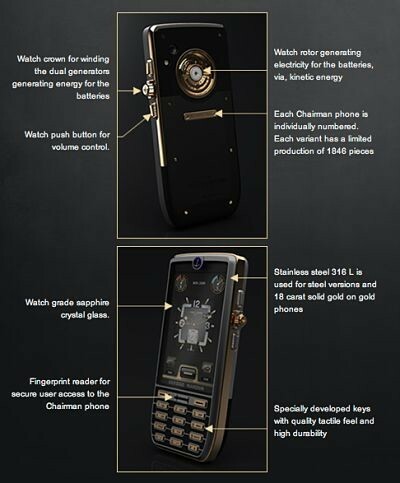 The cashed up can pre-order from the Ulysse Nardin Chairman Smartphone website. In a few months the phone will go on sale in Russian retail stores, making this phone de rigueur for the Russian industrial baron. While this phone has a few interesting features, style-wise for me it sits in the company of the more expensive Rolex watches. It attempts to manufacture a ‘stylish’ look by way of brand, rather than being an aesthetically pleasing execution. It’s a symbol of status, rather than a symbol of pleasing design. Still, that is I’m certain exactly the look they were going for with the Ulysse Nardin Chairman Smartphone.